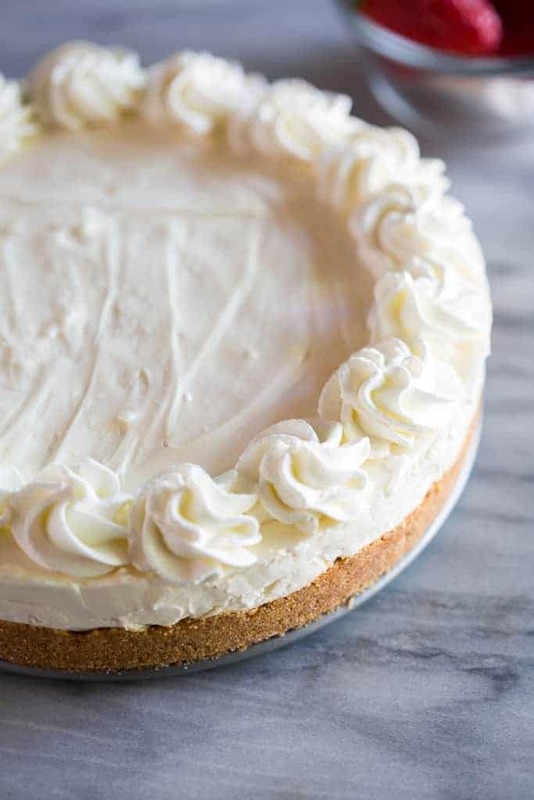 This No-Bake Cheesecake is made from scratch with a graham cracker crust and cream cheese filling. It’s an easy dessert recipe that will definitely impress! What’s not to love about No-Bake Desserts? They are easy, quick, and keep your house from overheating! I was amazed how easy and delicious this no bake cheesecake was. If you like easy, no bake recipes, you might like these Salted Chocolate Caramel Pretzel Bars or this Almond Coconut Chex Mix. 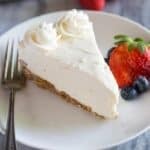 I can say with confidence that this No-bake Cheesecake tastes just as amazing as a regular cheesecake that you’d otherwise spend hours making. It’s absolutely delicious and has the perfect smooth, dense and creamy texture! 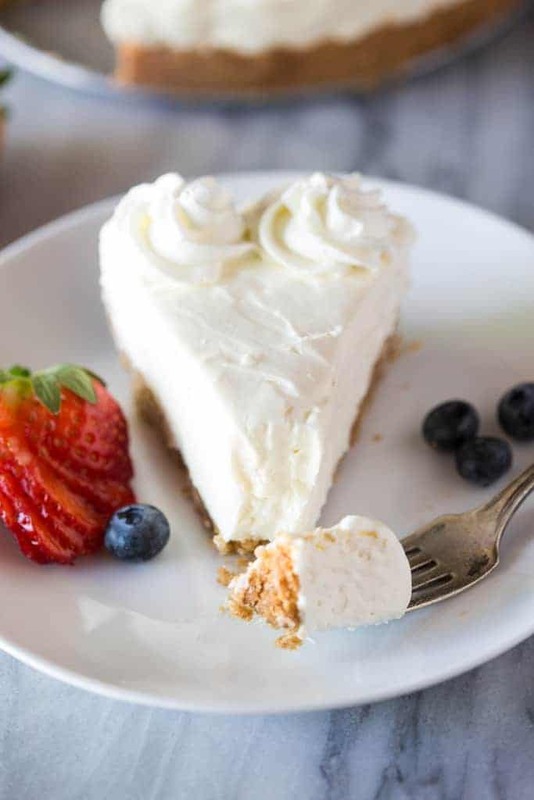 Though the title, “No-Bake Cheesecake” is self explanatory, you may think it sounds too good to be true and wonder what it really means. Well, “No-Bake Cheesecake” literally means it is not baked at all. 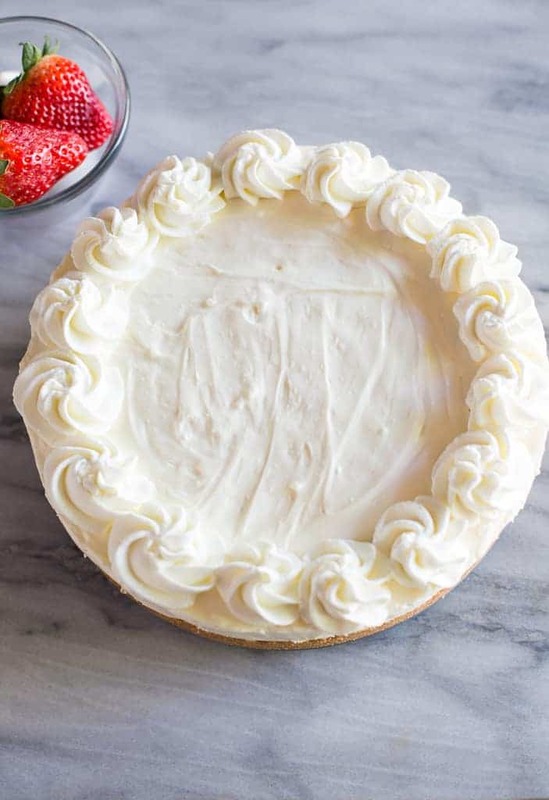 Both the cheesecake crust and the filling do not require an oven or stovetop! 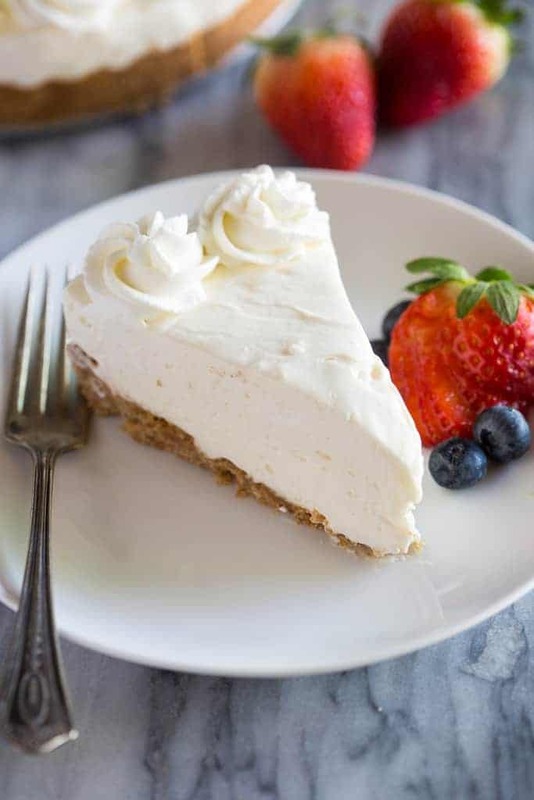 All you need to make this delicious cheesecake is 6 ingredients and a refrigerator! You will notice that I do use a baked graham cracker crust. I’ve think it holds it’s shape better. However, you don’t have to bake it. You can follow the instructions for my graham cracker crust, pack it very tightly into the pan and freeze it for 10-20 minutes while you make the filling. Prepare the Crust. Here’s my go-to homemade graham cracker crust recipe, or you can use a store-bought graham cracker crust. Prepare the filling. Beat the cream cheese, and then add the powdered sugar. Next add the vanilla extract and sour cream. 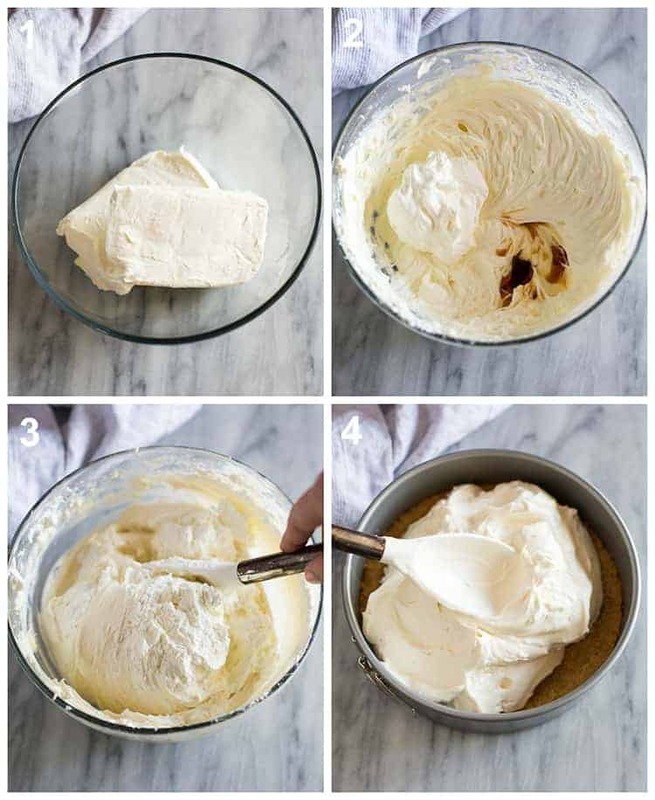 Beat the heavy cream in a separate large bowl until stiff peaks, and fold it into the cream cheese mixture. Pour filling in crust. Spread the cheesecake filling evenly into the graham cracker crust. Refrigerate. Cover the cheesecake and refrigerate for at least 4-6 hours or overnight. Can I freeze No-Bake Cheesecake? Yes, once the cheesecake has set-up properly in the fridge you can freeze it (or freeze the leftovers). Wrap the cheesecake well in plastic wrap, and then in tinfoil and freeze for up to 3 months. Thaw in the fridge before serving. Delicious! This is my favorite kind of cheesecake. My question is; did you use a spring form pan, and if so what size? The crust looks really thick, does it take a different measure of cracker crumbs to duplicate this? Thank you so much! I still can’t believe how easy this was. Cheesecake is always a little intimidating but not this recipe. SOO good, thanks for sharing! It really is so easy! I’m happy you liked it!